(Bloomberg) -- There is not much to be enthusiastic about when it comes to Europe. Sluggish growth, low inflation, political instability, Brexit and trade wars are part of a long list that doesn’t inspire optimism, let alone confidence. After Germany narrowly managed to dodge the recession bullet, it remains to be seen whether the old continent is capable of bouncing back. Europe looks like the global economy’s weakest link at the moment. Industrial production has been falling at the fastest pace since the financial crisis and Germany, once the engine of growth, is still on its knees, hit by slowing demand for its goods and a struggling car industry. For BofAML analysts, the 2018-2019 growth weakness will be temporary and will follow a similar pattern to 2015-2016, with demand stimulated by China. They are cautious, however, as their view is built on “accidents not happening,” such as no tariffs on cars, the avoidance of a no-deal Brexit, and stabilization in China. That’s a lot of “ifs.” With challenges faced by the auto sector, complex politics and limited room for the ECB to maneuver, risks are clearly skewed to the downside. They currently expect zero GDP growth for the first quarter of 2019. UBS analysts have recently slashed their full-year 2019 GDP forecast for Germany to 0.9 percent from 1.6 percent, citing drawbacks from difficulties in the car industry to production issues in the pharmaceutical sector. But are they too pessimistic? The analysts admitted that they might be underestimating the potential for a rebound, as production had started to show signs of settling. Still, UBS said the signs are conflicting. While car production shows some stabilization, the expectations for auto exports keeps falling. Even the weather is going against Europe’s biggest economy, with water levels on the Rhine so low from last year’s drought that delivery and supply chains are still disrupted. 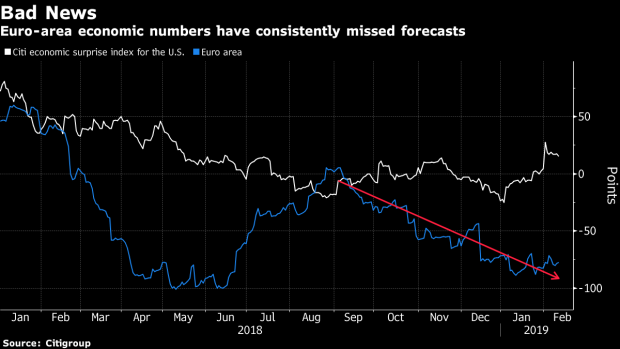 Germany’s feeble economy makes the ECB’s job more difficult as policy makers need growth (and inflation) to pick up so they can start to raise interest rates before the next economic downturn kicks in. Should this not happen, they may be left with very little ammo to counter-attack, further delaying a recovery in the profitability of the bloc’s banks. After U.S. stocks pared some of their gains yesterday following Senator Marco Rubio’s plan to curb incentives for companies to buy back stock, European investors are assessing the impact of German’s stagnation and Euro Stoxx 50 futures are trading up 0.2% ahead of the open. Watch banks as Credit Suisse Group AG’s trading revenue was ahead of estimates, trading revenue dropped at France’s Credit Agricole SA’s and Commerzbank AG confirmed it will resume paying a dividend. Watch U.K. homebuilders after new data from the Royal Institution of Chartered Surveyors (RICS) showed the country’s housing market has remained in the doldrums in 2019. Watch the likes of Taylor Wimpey, Persimmon, Barratt Developments, Bovis Homes and others, along with estate agents like Countrywide and Foxtons. Watch network stocks Nokia and Ericsson after U.S. peer Cisco gave a bullish forecast on revenue, sending its shares higher in extended trading. Watch Airbus suppliers after the planemaker confirmed it will stop making the A380 flagship superjumbo jet after a dozen years in service. Keep an eye out for a reaction in shares of companies including Rolls-Royce Holdings, GKN owner Melrose Industries, Safran and MTU. Also watch Jenoptik, whose lift systems are used to transport food trolleys between flight decks on Airbus planes, and on-board IT systems-maker Sopra Steria. Watch the pound and U.K. stocks as U.K. lawmakers will get the chance to vote on a series of alternatives to Prime Minister Theresa May’s Brexit plan. EU history shows pushing things to a last-minute summit, as May appears to want to do, doesn’t tend to go well. Watch trade-sensitive sectors as U.S. president Donald Trump is said to be considering pushing back the deadline of March 1 for the imposition of higher tariffs on Chinese goods by 60 days. Watch Spanish stocks as Spain’s socialist government saw its budget plans blocked on Wednesday, raising the chance that snap elections will take place. Ahlstrom-Munksjo Full-Year Dividend Per Share Matches Ests. Berenberg says the days of making easy money within the regulated utility space are over, with tailwinds from falling interest rates and rapid asset growth subsiding, and favorable dynamics harder to find. Top pick Italgas seen to be trading at a 50% P/E discount and 25% yield premium to bottom pick Red Electrica (sell) by 2023, says concerns misplaced on co.’s consolidation-driven growth opportunity. National Grid is other buy-rated stock, offers investors the chance to pick up its growing U.K. business at almost no premium to its regulated asset value. Terna and Snam rated hold. Morgan Stanley believes material risks to Royal Mail’s Ebit growth are now priced in, raising the stock to equal-weight from underweight. The share price also already reflects a “reasonable amount” of risk surrounding an expected dividend cut, the bank said. Bankhaus Lampe says Rocket Internet has no IPO candidates in its portfolio currently that would be large enough to have a significant impact on the share price, downgrading to hold from buy and reducing PT to EU23, the lowest among five analyst monitored by Bloomberg, from EU35. --With assistance from Hanna Hoikkala, Fergal O'Brien and William Horobin.